For many years now, we have been providing spare parts for the great Austin Healey. Today we put together a number of parts, which didn't exist at that time in this quality. Parts that increase the reliability and value of your vehicle without compromising its originality. We are proud of the quality of the parts we have produced. Austin Healey BN6 to BJ8 (1958-68) Very good fit, accurate reproduction, even in the substructure. With lock mounting plate. 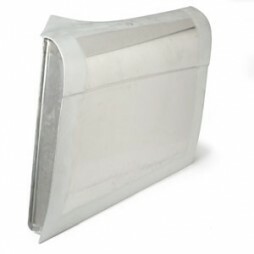 Made of sheet aluminium, with 15 air vents (louvers) on each side. Improves ventilation of the engine compartment substantially, very dynamic appearance. for Austin Healey BN4 to BJ8, lovingly made. The surface and shape are really good, our panel beater is very pleased. Over all as original, with perfect substructure and metal plate to hold the lock. Right door for Austin Healey BN1 from No. 5001 and BN2, made of aluminium. 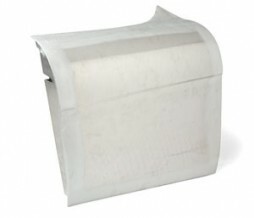 Reasonable good fit, good material strength and low weight. Left side of the vehicle. Manufactured in the same factory, every door is tested and approved by our Healey specialists. Oil pump, designed as a rotor pump with high performance. Made especially for us by a small company in southern England. Individually tested by our engine construction department. Suitable for road and fast-road specified engines. A 5-speed transmission ensures lower revs: quiet and low fuel consumption. We now offer the bell housing from our conversion kit for the ambitious DIY separately. Austin Healey BN4 to BJ8. In all details according to the original, with a more closely meshed high-performance core, which noticeably eases the thermal situation in today's traffic. Manufactured by a small but fine specialist company according to precise specifications in small series, available at an excellent price-performance ratio. Therefore: Modified swivel bearings at the top. Version with eccentric stud bolt to adjust negative camber. Own production in excellent quality. 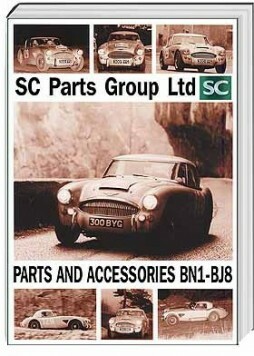 Complete vehicle set for all Austin Healey BN1 to BJ8 (1953-68). 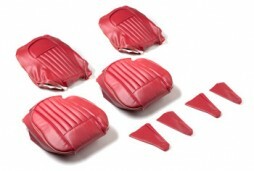 Set of original seat covers, consisting of 2x backrest, 2x seat and 4x side panels. Dark red vinyl with silver coloured piping. Very good workmanship: Embossed original pattern in the seat, sides made of skai, seams doubled. Made in England.